Public drinking fountains used to be everywhere, providing a reliable source of free, high-quality drinking water outside the home. They are a great alternative to bottled water, with its steep environmental costs and high price (200 to 1,000 times more expensive than tap water or more). Drinking fountains, however, have been disappearing from public spaces over the past few decades. Poor public perception and concerns over water quality (as illustrated in the “water fountain episode” of Parks and Recreation) have played a role in their disappearance. Water quality issues at public fountains, when they exist, can be traced to poor cleaning and maintenance or old piping and fixture parts. To ensure the quality and continuance of public drinking fountains, (1) they must be routinely cleaned and maintained; (2) old drinking fountains with lead parts must be replaced or new fountains installed in high-traffic areas, and; (3) modern tools must be developed to let people know how to find these fountains. The first two steps are decisions and actions that must be taken by our public agencies, politicians, businesses, and communities. But the third is something that new technology and social media tools can – and are beginning – to offer. We have compiled a list of smartphone applications that will help find drinking fountains and improve access to this valuable public resource. 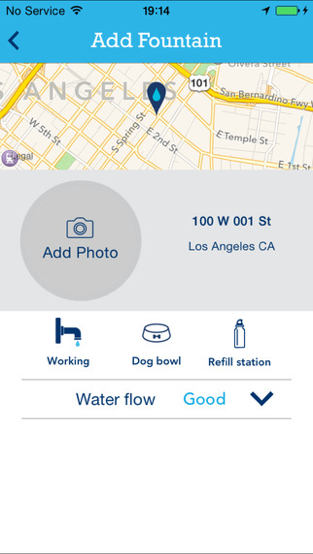 We examined 27 Android and iOS drinking fountain mapping apps. Of these, about 37% are available on iOS, 44% on Android, and 19% on both platforms. No perfect app exists; the majority are either largely lacking in fountain locations or are too specific to a certain region to be useful to most users, but we also understand that the options are changing rapidly, and new or updated apps regularly appear. Below, we identify the current apps that are relatively useful and comprehensive and also provide a list of helpful features that we would like to see developers incorporate into future drinking fountain apps or improvements. See appendix for a comprehensive list of drinking fountain mapping apps. The list of reviewed apps does not include those that no longer work. Some developers have created the same type of apps for each major city (for example, the Paris Amenities Map); for these we only include one example in our list. “Drinking Water Fountain” is our featured app for Android. NiSoft, the app developer, draws on crowd-sourced data from OpenStreetMap (OSM) to map water fountains all over the world. Cities with a high number of drinking fountain locations on the app include New York, Zurich, Paris, Madrid, and Rome. Drinking Water Fountain has within-app route navigation (it does not redirect to another app), an offline mode, and a user-input feature that allows users to add new water fountain locations to the map if they have a free account with OSM. The app is straightforward and easy to navigate. It has colored pins to indicate the status of fountains: “green” means functional, “blue” is unknown, and “red” is broken. A very limited number of locations come with descriptions of the fountain’s location and features, such as whether the fountain has a bottle refilling option. Users have the option of changing the distance units between miles and kilometers. The app was last updated in April 2015. Our featured app for iOS, “WeTap Drinking Fountain Finder,” has a long history. Early versions were developed by Evelyn Wendel, UCLA, the Pacific Institute, Google app developers, and Max di Cosimo, an Italian app designer. WeTap is now its own nonprofit organization, with a goal to “improve awareness, access, and use of public drinking fountains,” thereby improving public health and decreasing the consumption of single-use plastic bottles. Easy to use, the WeTap app maps public drinking fountains on a global scale, providing specific information for each individual fountain. 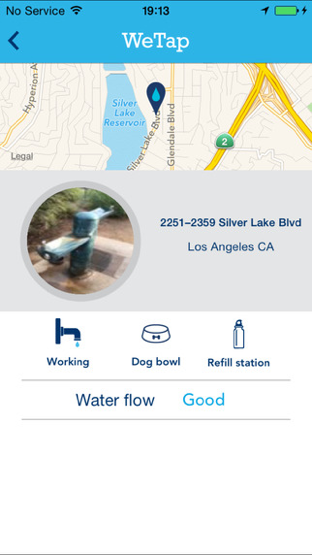 By clicking on the location pins, users can see specific characteristics of each fountain, such as the quality of water flow, whether the fountain is working, and if it is refill- and/or dog-friendly. Users can add and rate water fountains, and there is also an option to add a photograph. However, it is unclear how WeTap verifies the accuracy of user-input information. 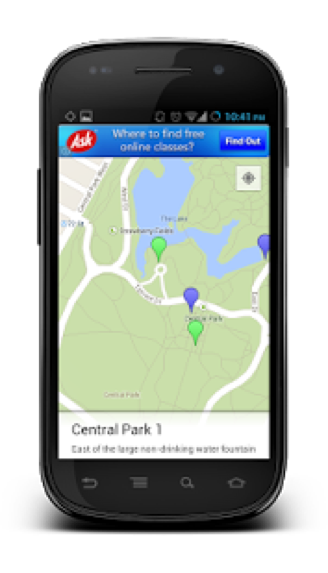 The app has many fountain locations relative to other global drinking fountain apps for both iOS and Android. However, some reviewers cite issues of inaccurate and/or missing locations, suggesting the need to create incentives to promote user engagement as well as a better input verification system. Version 1.0.0 (current) was released in November 2014 and has not be updated since then. “Quench,” a regional app, is available for both Android and iOS. TVOntario, a government-owned educational television network from Canada, developed this app along with the Bell Fund, the Canada Media Fund, and the Water Brothers TV show. They collaborated with local companies in the Greater Toronto Area to map restaurants and businesses that offer access to free drinking water as well as public drinking fountains. User-submitted locations are screened by the app administrator before being uploaded to the map. 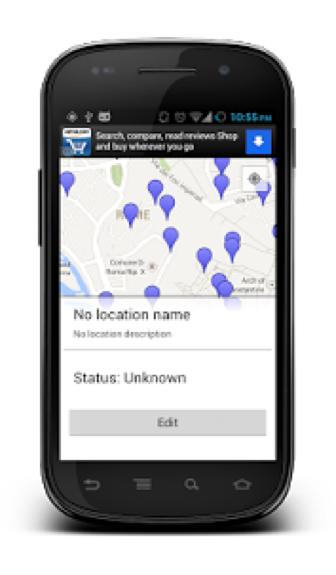 Users can also report a location if it is listed on the site but does not provide free water, which is handy when a fountain is not working or when a business turns a Quench user away. 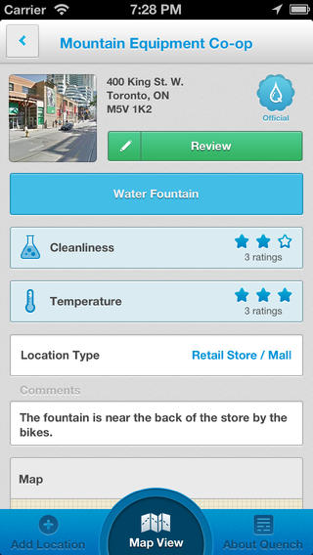 The app includes ratings for fountain cleanliness and temperature and a description of each fountain’s location. It integrates Google Maps into its route navigation system. The majority of the app ratings are positive, but reviewers have commented that the app does not work for Samsung Galaxy S5 phones. The app (Version 2.1.0) was last updated in 2013. These featured apps are some of the best tools currently available to find the nearest safe and functional public drinking fountains. However, each has limitations; a high number of fountains and accuracy of information is more often provided in apps with limited geographic scope. Apps that have global coverage, on the other hand, generally suffer from a lack of comprehensive and up-to-date data on fountain location and quality. There is a lot of room to make drinking fountain finders more user-friendly and useful. We provide a list of water fountain app “ideal features” below that could help stimulate the use of public drinking fountains. A comprehensive list of locations. The most common complaint reviewers have is the insufficient number of mapped fountains. A description of the fountain location, the state of the fountain, the quality of the water, and the water pressure. Photos are also helpful. Ease of adding new fountains to the map or modifying existing data. Users should also be able to submit additional information about the fountain, such as whether the fountain is indoor or outdoor, and whether it has an additional bottle filler and/or pet fountain. A verification mechanism for user-generated data. For example, new locations could be approved by the developer before being added, or the app could only publish locations that have been reported x number of times. A way to encourage users to add new fountains to the app’s database. Timestamps on these submissions to show how recent the information is. The app could map other public amenities (such as restrooms, information kiosks, and bus stations) to improve functionality. An option for users to rate fountains and filter their results based on fountain ratings. Different location pins with different colors and symbols to differentiate between public drinking fountains and businesses that offer free drinking water (if the app has partnered with local businesses), broken and working fountains, and whether the locations are reported by users or not (if applicable). Downloadable maps for offline use. Route navigation to nearby fountains. The option to choose different modes of transportation, such as walking, biking, driving, or taking public transit, is an extra perk. Distance from the user’s current location to the nearest water fountain, provided in both imperial and metric system units. This feature should be available for apps with a global scope. Contact information for the agency in charge of maintaining the fountain listed in the fountain description, or the capability to alert a participating agency directly about needed repairs. A way to encourage the public use of drinking fountains. This could include social media buttons to share fountain locations or an integration with a water intake reminder app containing suggestions for the nearest fountains. Below is a comprehensive list of 27 water fountain finder apps available on iOS or Android platform or both, not including those that do not work. The reviews are current as of April 2017. This is a well-designed, easy to use map of water fountains, restrooms, and historic sites along the Austin Trail in Austin, Texas. The app is simple and fast. Without extra features, everything loads quickly and the locations of the fountains and restrooms are easy to distinguish. It is also able to provide notifications when the user is near a water fountain or restroom. However, it does not offer any information about individual restrooms or fountains, which would be useful and necessary for a comprehensive drinking fountain map. Limited to Rome’s historical center, Drinking Water appears to have a comprehensive list of fountains, but it is likely out of date (the app was last updated in 2010). By clicking on a pin on the map, users can access a photo of each fountain, report a broken fountain, or add a note. Fountains that are not working are crossed out on the map. Findafountain started out as a mapping app for London, United Kingdom, but it has expanded to other areas in the UK as well as abroad. The fountain list is most comprehensive for London. The app relies on registered users (“volunteers”) to provide and correct drinking fountain information. The app website indicates that any changes to the map will go through a “rigorous verification process before going public,” but it is unclear what this process entails. Overall, there is adequate information for the fountains that are mapped. The app differentiates between indoor and outdoor fountains, and the state of repair and quality of water are shown by clicking on the location pins. Fountain Finder is specific to the Lakefront Trail in Chicago. The app costs $0.99 to download. It shows the location of public fountains, restrooms, and places to eat. It designates which fountains are available year-round, identifies pet-friendly fountains, provides photos of each fountain, and allows users to save the location of their favorite fountains. This is an outdated map of public fountains in Rome (along with a few other international locations). One interesting feature is that the app has a link to a book with a paper map of Rome’s public fountains. Designed as a bike map, this app includes public features that might be of interest to bikers, including water fountains. The app costs $0.99 and only covers New York City. This app is made specifically for Yerevan, Armenia; “Pulpulak” is an Armenian word for a public drinking fountain. This app allows users to search for fountains by street name, upload locations, and rate fountains and fountain water by several different criteria, including cleanliness, coolness, and taste. Users can filter their results based on these ratings. Although Tap Map is limited to Vancouver, it appears to have an extensive map of public fountains in the city. Clicking on a fountain will reveal a description of its location, who can access it, and who, if anyone, maintains it. Users can also submit new fountain locations. Well-designed, fast, and easy to use, WeTap maps public water fountains globally and also provides information about each individual fountain. By clicking on the pins, users can see the quality of water flow, whether or not a fountain is working, and whether a fountain has an additional bottle filler and/or pet fountain. WeTap features many fountain locations when compared to other global iOS drinking fountain finders, but some reviews cite inaccurate or missing locations, suggesting there is still information that needs to be added or reviewed (the total number of written reviews is limited). WC Venice maps restrooms and drinking fountains in Venice, Italy. Location and fees, as well as the hours of operation for weekdays, weekends, and holidays, are provided for each toilet and fountain, when applicable. There is a route navigation feature, and users can input new locations and update information about existing ones. This app was created by the Tennessee Clean Water Network to help reduce the consumption of sugary drinks. It maps drinking fountains, bottle refill stations, and public pet fountains and includes route navigation. Each fountain has a description and, in certain cases, a photo. A user can add a location by inputting the current location or adding a pin remotely. The geographic scope is limited to Tennessee, USA, and a few other locations in Seattle, Los Angeles, Atlanta, and Salt Lake City. A redeveloped version of I Nasoni di Roma, this app is one of the more popular drinking water apps. It is no-frills and straightforward to use. It maps the location of drinking fountains in Italy and provides distances and route guidance, but it does not provide information about each fountain. This app features within-app route guidance to the nearest fountain, an offline mode, and the ability for users to add new fountains through an OpenStreetMap account. The app has a relatively large number of locations, especially for more populated areas. It color-codes location pins to indicate functional or broken fountains as well as fountains that do not have an exact location. This app, developed by Because Water, has some interesting and innovative ideas for drinking fountain mapping. With the goal of decreasing the number of plastic bottles bought when people are outdoors, Drop In App partnered with businesses to allow the public to access tap water for free. The end result is a nicely designed, easy-to-use map of participating businesses and public water fountains. Pins are color-coded to differentiate between public fountains and participating businesses and to show user-reported locations. Currently, there appears to only be an adequate number of fountain locations listed for particular New York neighborhoods. This app was developed as an electronic trail map for the city of Columbia, Missouri. The developers used GIS to create the system, mapping amenities including water fountains, bike repair stations, and restrooms. 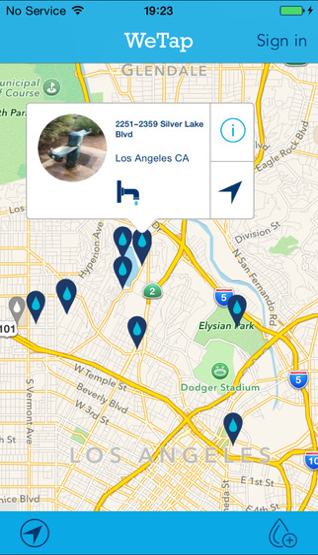 This app aims to help users find and report free public water sources. Markers on the map indicate the type of water source (e.g., drinking fountains are marked as green) as well as the distance of each fountain from the user’s location (e.g., fountains that are closer to the user’s location are shown in yellow). One significant drawback of this app is that it requires a Gmail account sign-in before users can access it. A pixelated map of Paris with the location of nearly every service available, from bicycle rentals to pubs. The app shows more than 15 different amenities, but users can only see public restrooms, ATMs, banks, and post offices with the free version – everything else, including water fountains, comes with the $0.99 version. 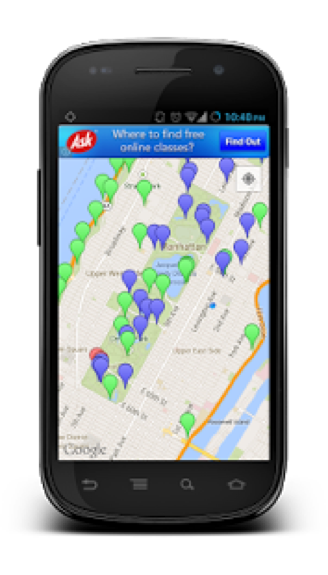 The app developer has also created an Amenities Map app for 33 other major cities besides Paris. Created by a software engineering student at the University of Waterloo, this app shows public fountains, restrooms, and restaurants. The app draws information from OpenStreeMap. It does not have an offline mode or colored pins to quickly identify functional fountains. Quick and easy to use, the limited scope of this app (17 fountain locations) would only make it useful for those in the main area of Ljubljana, Slovenia. By clicking on a fountain, the user can also see nearby attractions. TrailLink provides a number of trail maps and includes the location of water fountains and other amenities along each trail. In-app purchases are required to access all the maps. This app has an offline feature, which is a useful feature for many hikers. 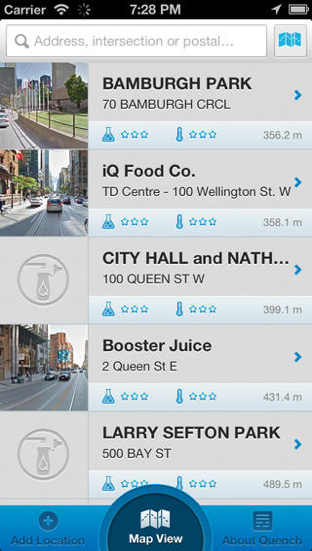 This app includes the locations of drinking fountains and over 20 other services and amenities in Vancouver. It also provides information on current weather and road closures. In-app purchases may be required to access some of these features. Vienna Mobile is an ad-supported mobile application that maps over 30 attractions and amenities, including drinking fountains, in Vienna, Austria. It provides route guidance via walking, driving, or public transportation. The app shows real-time departures for public transit and provides information on events in the city. This app maps locations of drinking fountains, benches, restrooms, and picnic tables. It is one of the few apps containing a relatively comprehensive list of fountains, since the app relies on OpenStreetMap. However, Benches can be challenging to use: it lacks route navigation and has limited zoom-out capability. This app is relatively fast and appealingly designed. It includes the locations of publicly available restrooms, BBQ pits, and restaurants, as well as drinking fountains. While there is a decent number of fountain locations listed, the list is by no means comprehensive. The app uses the same symbol for all features (for example, a BBQ pit is marked using the same symbol as for a water fountain), so it is not possible to distinguish between the pins on the map unless the user filters out everything except for one feature or manually clicks on each pin. The geographic scope is limited to Southern Australia. This mapping app provides information on both public drinking fountains and decorative fountains. It has a simple, yet user-friendly design, and provides route guidance, the distance from the user’s location to each fountain, and basic information about each fountain. Fountain locations are available in either “list view” – which the user can organize by address, name, or distance – or “map view.” The app distinguishes between regular fountains and those that are historically or artistically significant and provides additional historical information about the latter. One important negative aspect of this app is that it requires a number of permissions before installation, including calendar, phone status and identity, and network connections. TVOntario, a government-owned educational television network from Canada, developed this app along with the Bell Fund, the Canada Media Fund, and the Water Brothers TV show. 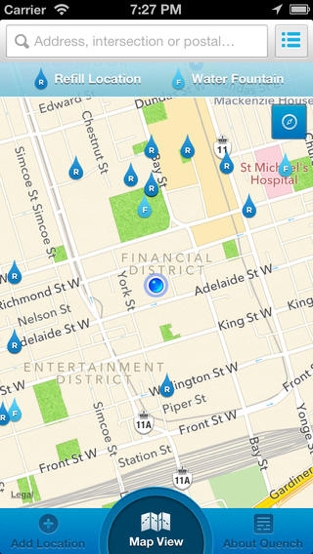 They partnered with local businesses in the Greater Toronto Area to map businesses and drinking fountains at which people can access free water. Users can submit locations, which TVO then screens before uploading them to the map. Users also have the option to report a location if it is listed on the site but does not actually provide free water. The fountains can be rated based on cleanliness and temperature. Although the majority of the ratings for this app are positive, some comments indicate that the app does not work for Samsung Galaxy S5 phones. This app partnered with local businesses in the metropolitan DC area in order to increase public water access. It provides a map which includes pins for both the locations of public fountains and participating businesses providing access to drinking water, but it does not visually differentiate between the two, so users must click on each pin to find out what type of location it represents. Users can “favorite” locations or share locations on social media, such as on Facebook and Twitter.